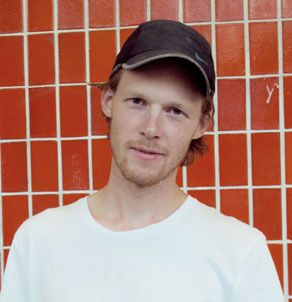 As a part of a final project at the Royal Academy of Art – School of design in Denmark in 2013, Master Graduate Jonas Edvard Nielsen focused on the natural function of the mycelium mushroom to develope a new food production method based on waste. MYX textile material and The MYX lamp was created. MYX© is a new innovative textile material that is grown into shape during a period of 2 weeks. It uses the strength of long plantfibres and the mycology of the oyster mushroom mycelium to create at lightweight, soft and insulating textile material, that can be used as a low-cost, organic, and compost-able product. 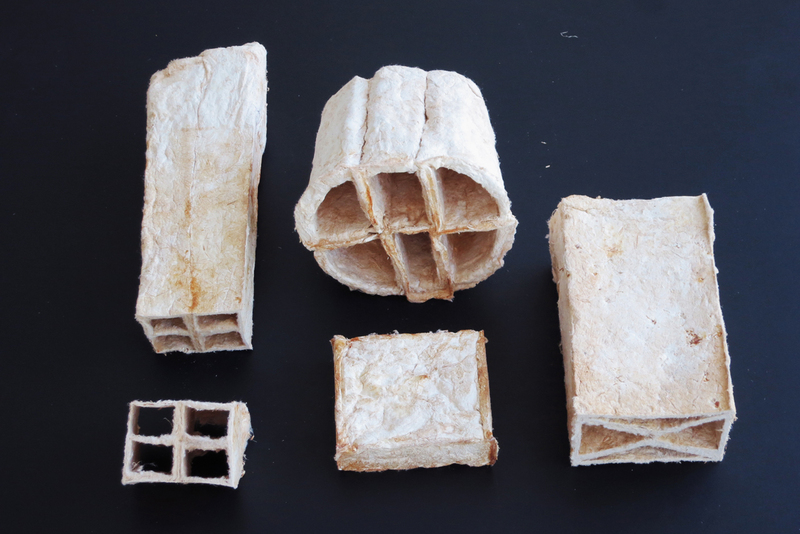 The Mushroom mycelium is able to take apart cellulose and besides growing the raw material into shape it also produce healthy, edible and fresh organic mushrooms in only a couple of weeks. The mycelium is the roots of the mushroom and the mushroom we eat is the fruit of the mycelium. 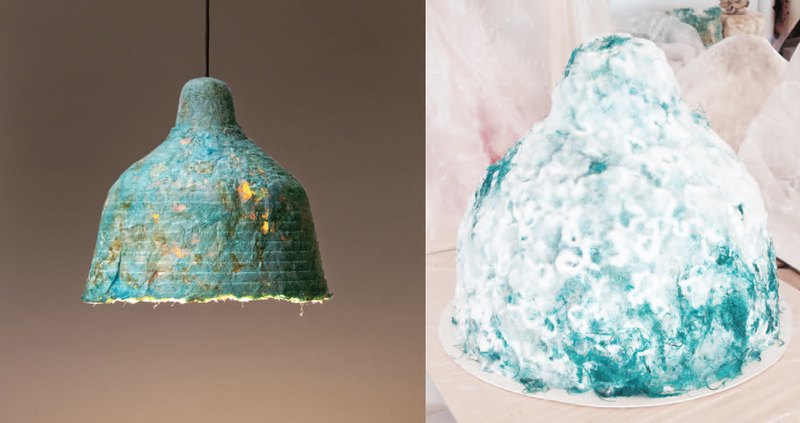 During the production of one MYX lamp the mycelium spreads through the textile matt creating a network of mushroom roots, that collects energy from the cellulose plant material. the mycelium transforms the cellulose into sugar and uses that to produces mushrooms, making the mushroom production completely autonomous. When the mushrooms a ready to pick you simple cut them off and eat them. The Oyster mushroom contains high amounts of Vitamin B3 and the majority of mineral salts required by the human body. The MYX lamps is made from the waste of mushroom production, and after drying out the lamp, what is left is a new and lightweight material created by the mushroom mycelium. The plant fibres in the MYX textile is a leftover from the textile clothing and rope production. The leftover fibres is normally composted or added to building materials. By creating mushrooms out of waste material the plant fibres is recycled and their status as waste is changed creating a upcycling of material where the biproduct is a optimized waste solution. 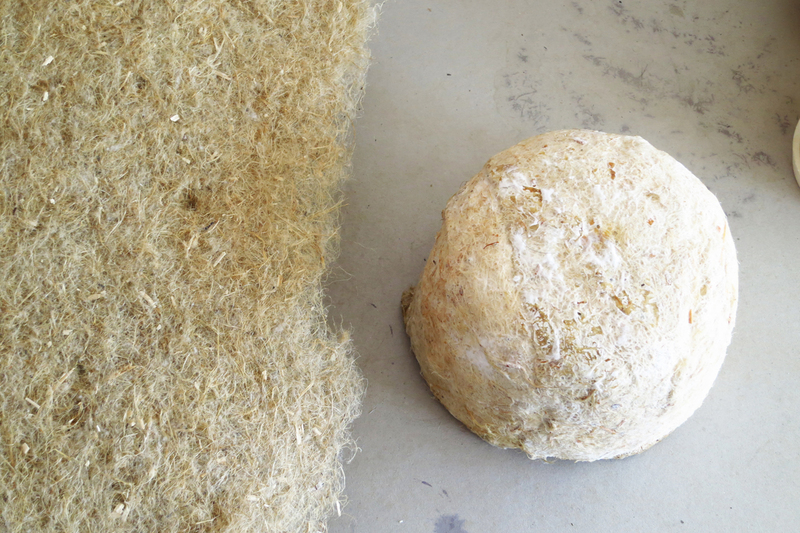 The raw material versus the mushroom grown shape. © Image: courtesy of Jonas Edvard. The MYX – textile mushroom material – transforms the organic plant fibres into a soft flexible matter after the full development of the mushroom mycelium. The durability and strength of the fibres gives the final material a flexible and sturdy appearance. 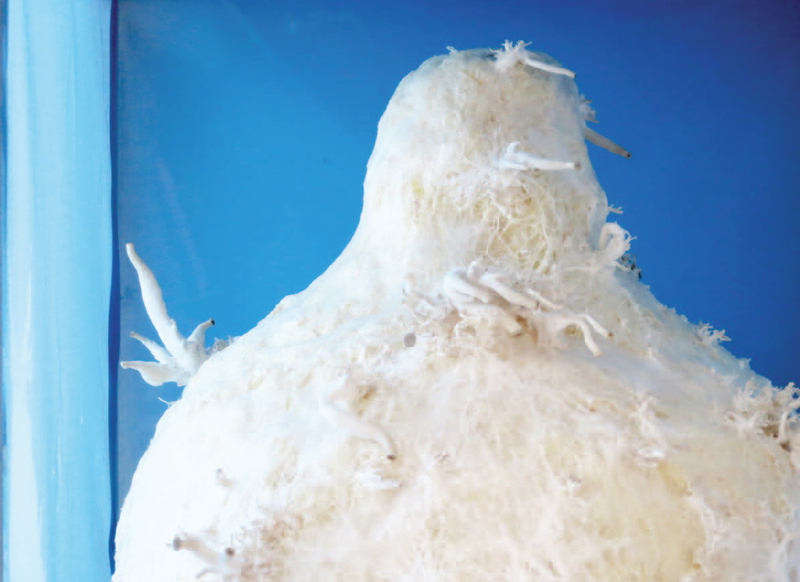 The mycelium grows together the fibres by physically gluing them together, growing in an out of the fibre matter. Chitin is the main ingredient in the cell walls of mushroom and is also found in the protection surface of shellfish and insects. The function of the material gives it a high quality as custom shaped organic insulation or as material for packaging, – sound absorbing, and flameproof. Myx lamp in Turkish colour. The cellulose fibres are able to be coloured with natural textile dye. © images courtesy of Jonas Edvard. value and experience for the consumer, the society and environment. As Jonas Edvard says: “My MYX project addresses the industry and the surrounding society, by challenging the production method of design products. By combining the creation of functional products with food production it adresses a certain problem in the development of sustainable product design – the waste problem. 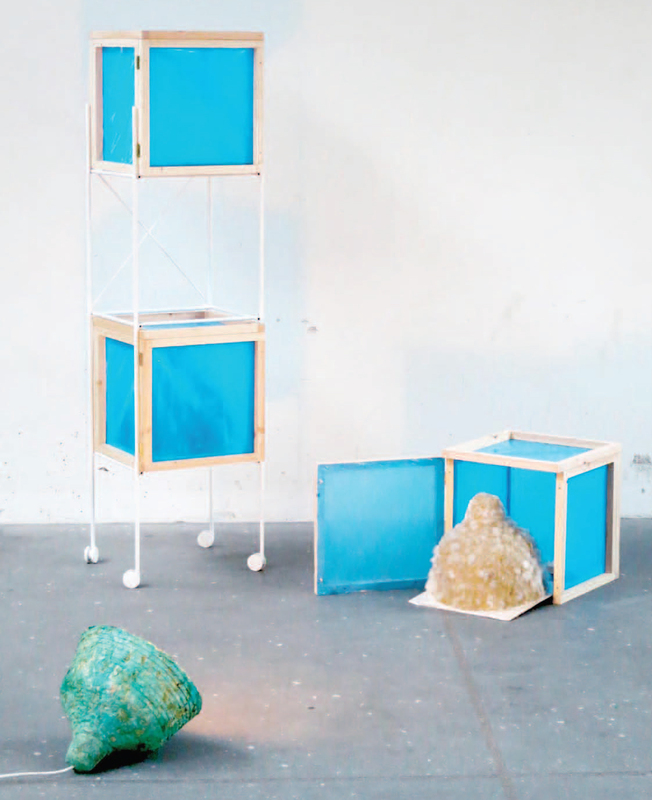 An earlier post here on Hello Materials Blog by Sam Harrington tells the story of Ecovative who also uses the mycelium fungi to grow their products. Read it here. This entry was posted in Material Innovation and tagged bioadaptation, bioinspired, biology, Ecovative, environment, materials, Mushroom, mycelium, Oyster mushroom, science, sustainability. Bookmark the permalink. Once the mushroom base has been blossoming for three months, the bedding for the mushroom plant should be readied. The material that the mushrooms are to grow in is known as the substrate. One strategy is to sanitize straw in a ten to one blend of water and peroxide. The straw ought to be saturated in the peroxide arrangement. At that point, the cultivator can add some straw to a plastic cooler sack and a portion of the mushroom base.